Months and months in the making, we're finally ready to reveal our latest website series, Happily Ever Home, a special DIY home series that is focused on modest & midsize home styling projects for newlyweds who are renters or first-time home owners. Neither of those? We love you, too, and hope you get inspired for your own "making a house a home" projects with this new series! And since this is the brainchild of our editor-in-chief, Chelsea, so we're going to let her take it from here! 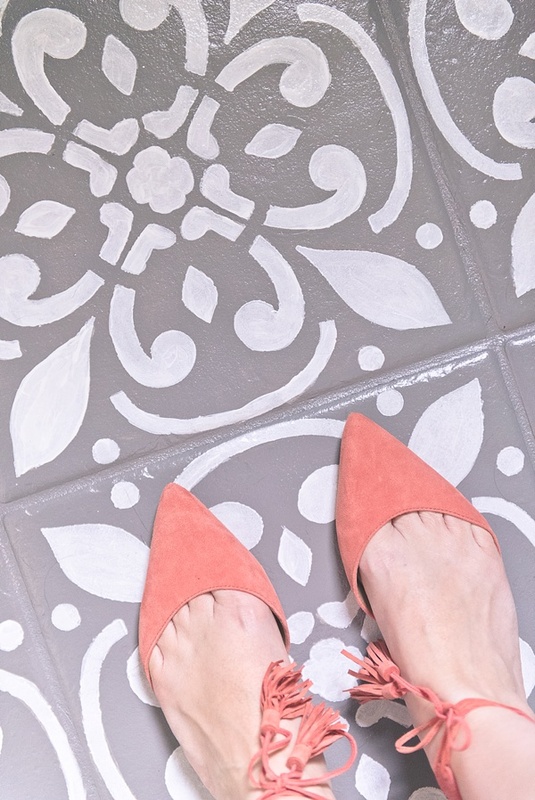 For our inaugural project for this series, we're busting out the paint and rollers and sharing how to completely transform your builder basic ceramic floor tiles. 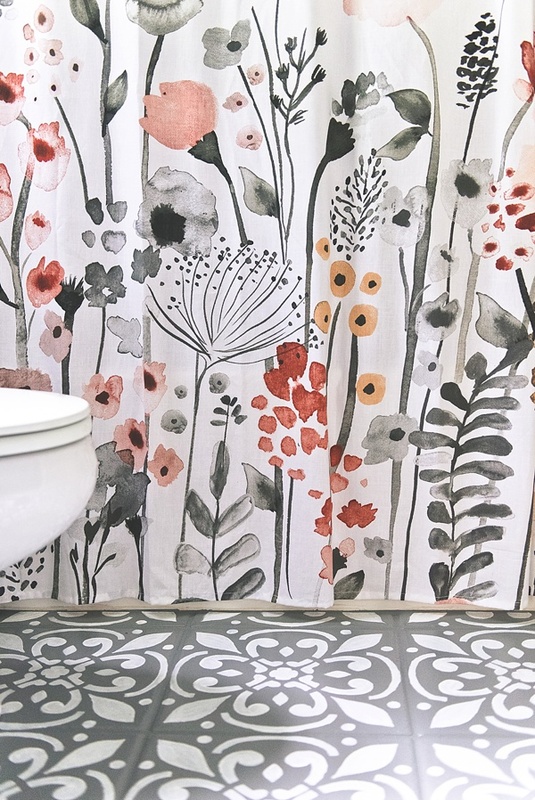 If your tiles are like ours, they are that strange peach-brown color that just always looks dirty... which is not something you want in a guest bathroom. 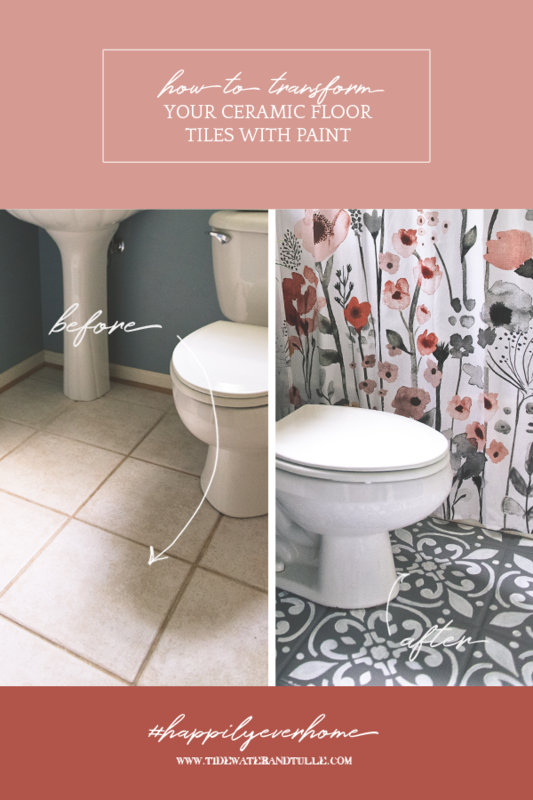 With some patience, stencils, and quality paint, you can give a complete makeover to your tiles in a couple of days' time. Let's get to work! • DecoArt Multi-Purpose Sealer, 8 oz. 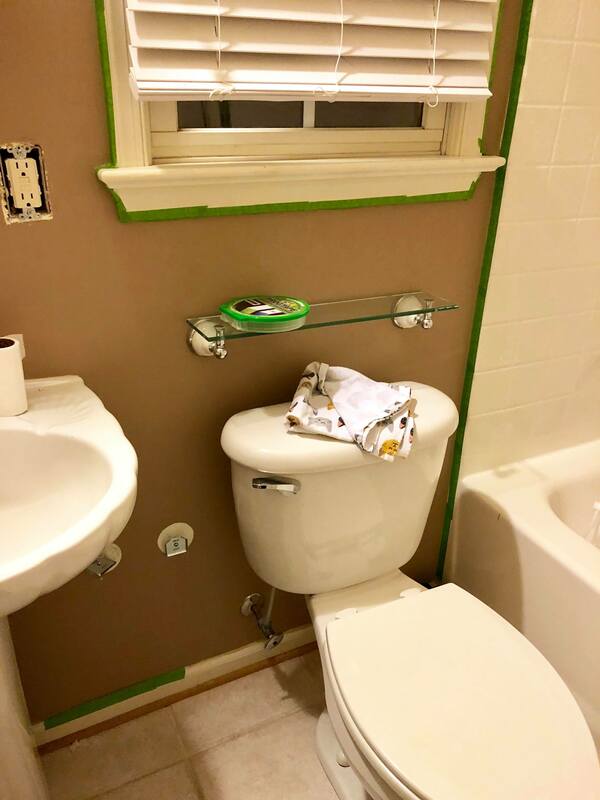 Our small bathroom is only about 22 square foot, so I ended up needing one 8-ounce jar of each Outdoor Living paint color because I added the multi-purpose sealer which doubled its volume. (From the DecoArt website, one 8-ounce paint jar provides a two-coat coverage on approximately 25 square feet.) I still had leftover paint that is great to have on hand for redos, touchups, or other projects. So if you have a larger space, factor in having a bit extra on hand like you would with regular wall paint. For the polyurethane sealer, we ended up buying a gallon to have on hand for other things, but doing three coats barely used any of it. You can definitely do a similar small space with just a quart-sized container. 1. Before doing anything, let's prepare your floor! Sweep and clean your tiles as best as you can. After you do so, it's time for the mineral spirits treatment. This will help degrease and clean your floor for maximum adhesion with your paint. Using an old rag, soak in the mineral spirits and wipe your floor. Use a paper towel or another dry rag to wipe excess mineral spirits. Allow to dry. QUICK TIP: If you've never worked with mineral spirits before, there are a few things to keep in mind. Even if it says odorless, keep your area well-ventilated with some sort of air flow; it's a petroleum-based product and still can cause dizziness. Follow the directions precisely on the mineral spirits' can when scrubbing your floor. Your floor will feel very oily, but after 20-30 minutes, it will evaporate leaving a nice dry surface. Dispose product properly and avoid pouring mineral spirits down the drain. 2. 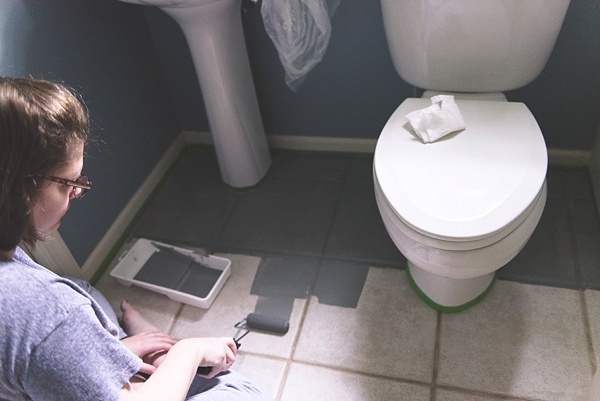 Once your ceramic floor is completely dry and prepped, tape off your walls, toilet, sink, and other things that you don't want painted. 3. 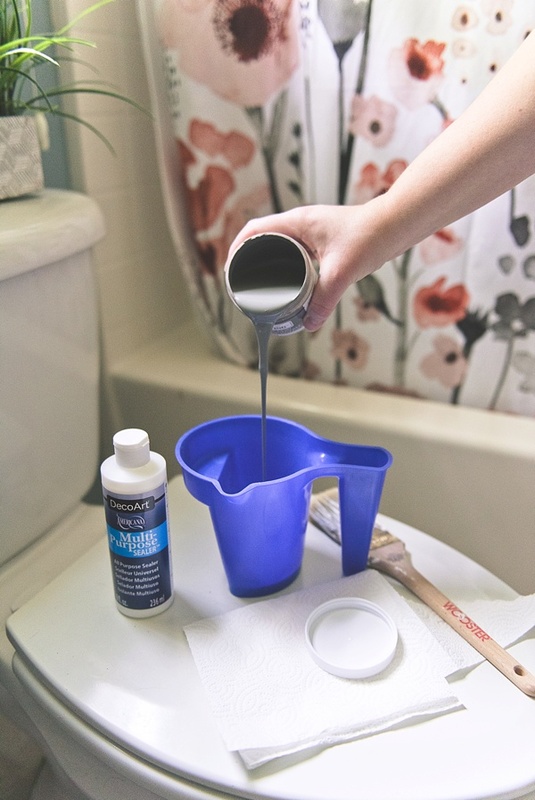 Open your base color paint (gray is ours), pour into an empty paint cup/bucket, and stir in equal parts multi-purpose sealer (note: this is not your polyurethane sealant; this is the paint-specific sealer). 4. 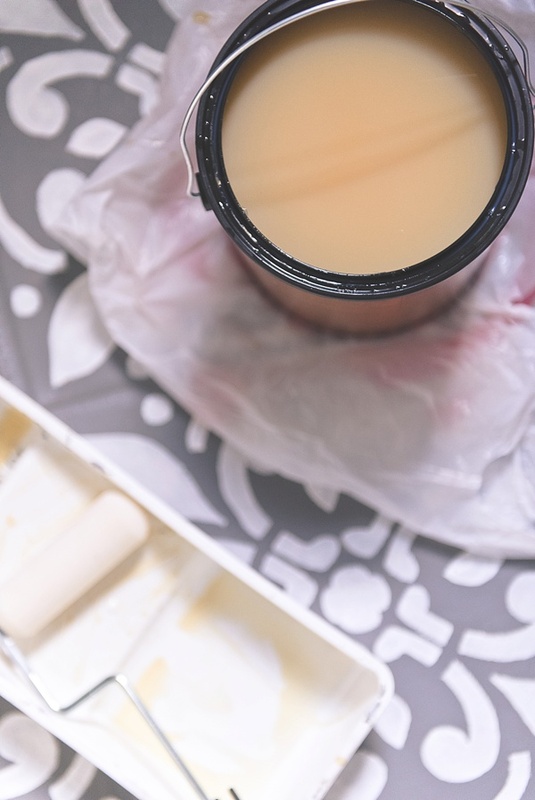 Pour your newly mixed paint into a roller tray and start painting! QUICK TIP: It's important to use a foam roller for this project. The "fuzzy" roller refills aren't the best when it comes to clean stenciling and polyurethane sealant. 5. After you paint your first coat, allow to completely dry for about 2 hours between additional coats. Our base color took about 2 1/2 coats of paint for full coverage. 6. Using a thin paintbrush, do touchup work on your edges and crevices. Let your floor fully cure overnight before you start the stenciling detail. QUICK TIP: Preserve your paintbrushes and paint trays! With some dish soap and warm water, soak, rinse, and dry your painting materials after every use. 7. 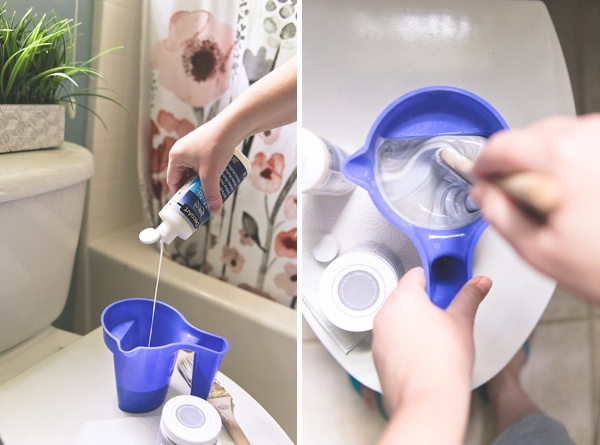 The next day, open your stencil color paint (white is ours), pour into an empty paint cup/bucket, and stir in equal parts multi-purpose sealer. 8. 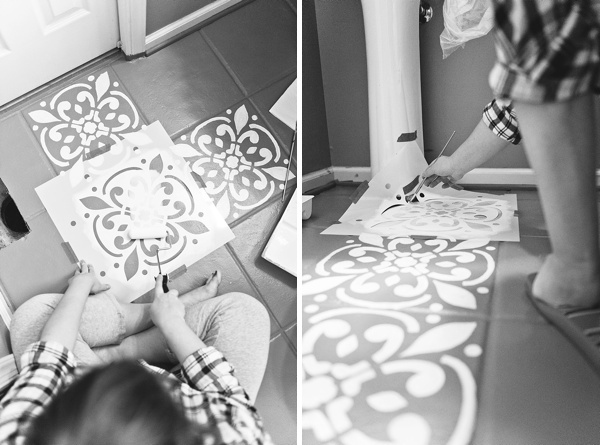 Plan out where to start stenciling first in your space. 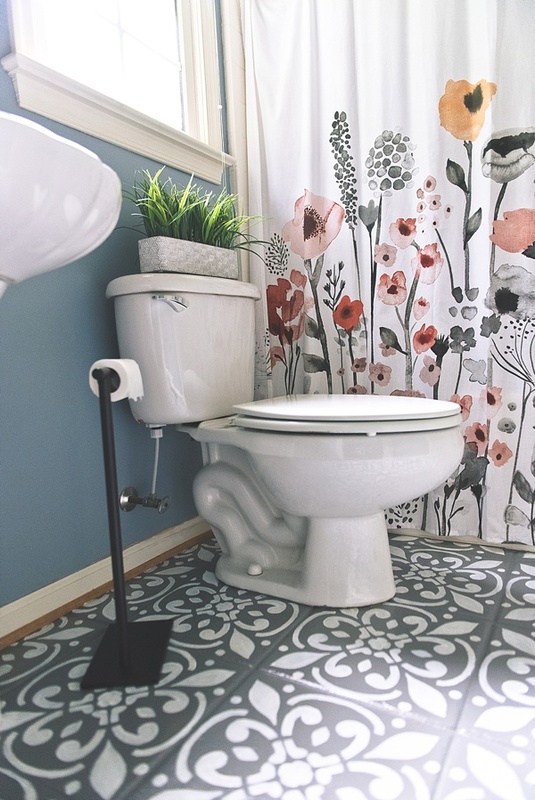 We recommend the furtherest away "full" tile. When stenciling, there are no multiple coats as that can turn messy designs, so be intentional about where and how you paint with your stencil. 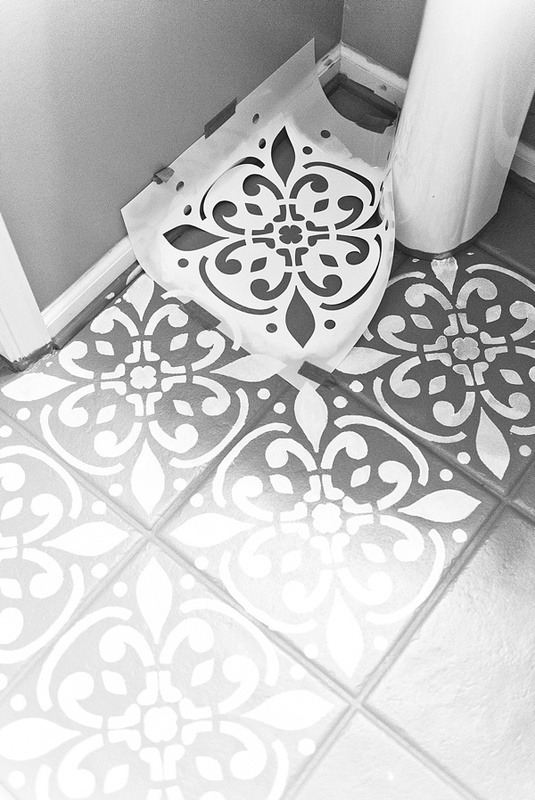 You will want to touch up with a paintbrush after the paint roller stenciling either way to make the stencil paint look more like a glazed ceramic tile. 9. Once ready, tape down your stencil in place and roll your stencil paint onto your foam roller. Be careful to not have too much paint on your roller since this can leak or leave blobs underneath your stencil. Make sure there is full coverage of your paint before removing the stencil from the floor. 10. Work your way across your floor, square-by-square. Consider alternating tiles to allow neighboring tiles to dry since the stencil will overlap. For awkwardly-sized tiles, a high quality stencil like we used will bend without breaking or creasing. 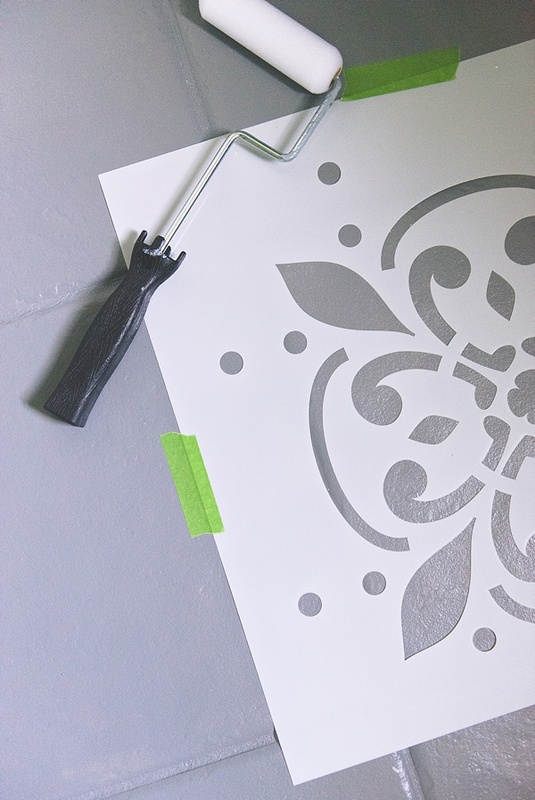 You may end up having to freehand some of your stencil design for those hard-to-reach spots! Leave those for last. 11. After your floor is fully stenciled, let it dry for an hour before doing touchups on your tile design with your thin paintbrush. 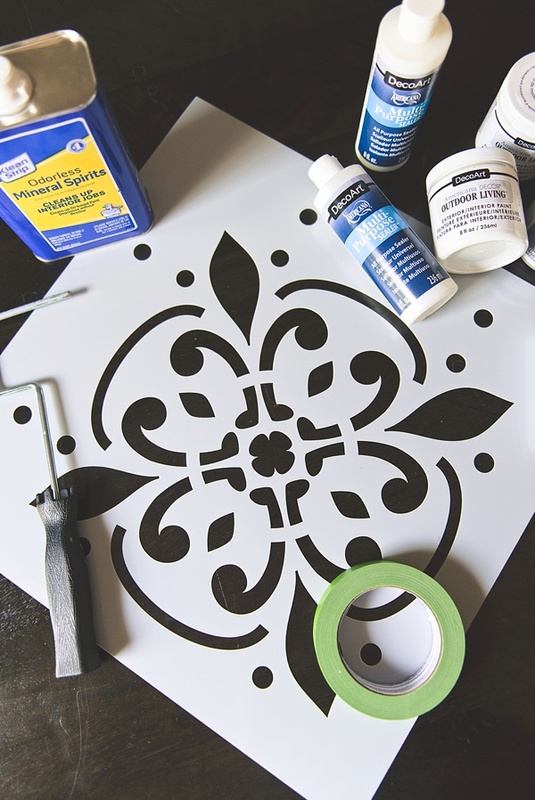 QUICK TIP: After going over your stencil designs, use your extra base color paint to "erase" stray blobs or lines from your stenciling mishaps. You'll never know there were mistakes after it dries! 12. Time for the most important step to make sure all of your tedious work is still awesome after real life hits the floor! With a new foam roller, roll one coat of polyurethane on your painted floor. Allow to dry for 2 hours. 13. Apply your second coat and allow to dry for another 2 hours. Finally, apply the third coat and allow to dry overnight. QUICK TIP: Polyurethane is typically used on wood floors, but it works just as great on ceramic as you can see! I chose an oil-modified water-based version because it's designed for floors and had an easy water cleanup. You can always do additional homework to see if another one works for you! 14. Now your gorgeous new floor is ready for light use! Per the polyurethane's instructions, avoid heavy traffic for 72 hours and do not clean for 7 days. When that's over, put your room back together with your accessories and enjoy the home refresh! When researching this project months ago as an affordable floor upgrade (until we can bust out these ceramic tiles and replace with custom Portuguese tiles of my dreams), everything I read said this painted floor will last for years and years if prepped and treated properly, even in high traffic areas. The polyurethane and its many coats are key! 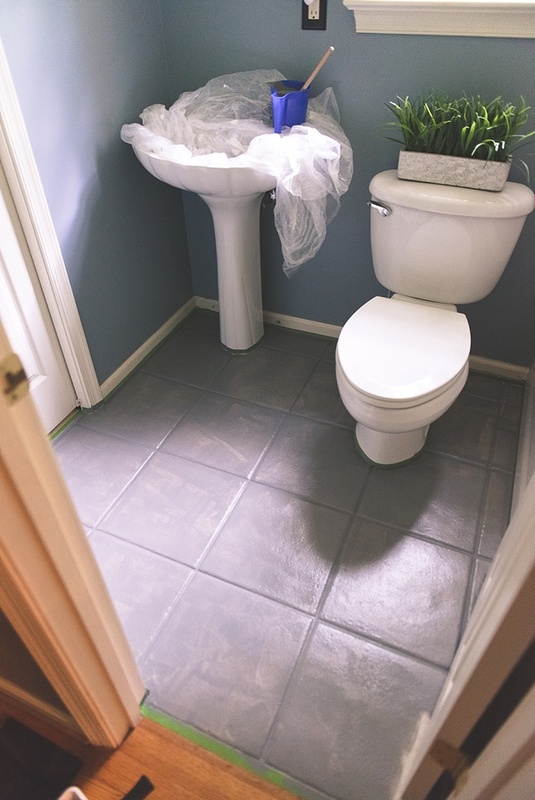 This tiny bathroom isn't used as an everyday bathroom for us (aka we don't use the shower), so we don't have rugs down but rugs would definitely help preserve your hard work longer. What's next? The sink! Before the floor project, we removed all of the builder basics, sprayed painted the wall light, floor vent, and light switch cover, and painted the walls in that pretty blue color. (You can see a before photo of all that here.) The duo-tone sink faucet and shell-shaped sink are not my style, so one day, we'll install a new one. Stay tuned for our next Happily Ever Home tutorial next month as we share how to make a feature wall with peel-and-stick wallpaper... it's especially perfect for renters! Happily Ever Home is Tidewater and Tulle's DIY home series that is focused on modest & midsize home styling projects for newlyweds who are renters or first-time home owners. Neither of those? We love you, too, and hope you get inspired for your own "making a house a home" projects!